Movie Review: “The Hunger Games” Have you seen it yet? One of the most anticipated films of 2012 that is not a sequel has reached theatres. “The Hunger Games”, based on the novel by Suzanne Collins (she also contributed to the screenplay), is a disturbing yet riveting look at a future that one would hope could never happen. It gives us a very plausible and unforgettable heroine upon which the story centers, portrayed by Academy Award nominee Jennifer Lawrence. Warning: for those who have not read the book, some of the following could be considered mild spoilers. The premise here is that following a devastating war in North America, a new nation called Panem emerges. It is comprised of a prosperous Capitol and 12 outlying districts which are teeming with poverty and starvation. To remind the districts who is in charge, the Capitol requires that every year, two teenagers are selected from each district to engage in a televised fight to the death known as the Hunger Games. The prize for the winner, apart from survival, is that his or her district will be assured of enough food, at least until the next competition. In the 12th and poorest district, where everything is grey as though it was covered in coal dust from the mining that is their primary industry, a 16-year-old girl named Katniss Everdeen, with the help of a boy named Gale, has been illegally hunting wildlife out of bounds to keep her mother and little sister, Prim, from starving. When Prim’s name is drawn to participate in the Hunger Games, Katniss volunteers to go in her place even though it will likely result in her demise. The other contestant from District 12 is Peeta Mellark, the baker’s son with whom Katniss is acquainted. All too soon, the two teens are whisked away to be groomed, glamorized and marketed for the delight of viewers and potential sponsors. When Katniss and Peeta arrive in the Capitol, the crowd that greets the train is so outrageously and colorfully attired and coifed that it reminded me of Cirque de Soleil. Katniss is assigned a stylist named Cinna, played by Lenny Kravitz. She is also supposed to be mentored by a previous Hunger Games winner from her district, Haymitch (Woody Harrelson), but this proves problematic as the man is drunk most of the time. Keeping things organized is Effie Trinket, played by an almost unrecognizable Elizabeth Banks in Capitol-style makeup. The competitors, known as tributes, are allowed four days for training, and they make two public appearance prior to the start of the Games. In the first, the opening ceremony, each district’s pair of tributes parade by in a chariot in front of the president and throngs of cheering Capitol residents. It brings to mind ancient Rome, where atrocities were committed in the Coliseum for the amusement of the rich. For the interview portion, a slick blue-haired host, played by Stanley Tucci, asks each tribute questions, like in a beauty pageant. The irony is, of course, that these particular interviewees will soon be thrown into an arena where they must kill or be killed. One thing I appreciate about the film is that they did kept the character of Katniss believable. So many movies turn a female protagonist into a super hero or objectify her. But here, when the countdown begins and Katniss prepares to be released into the arena, she is shaking from head to toe as one would expect of a scared 16-year-old girl. I dislike films where violence is stylized and excessive to the point where the audience actually begins to cheer when someone dies. Here, what you do see is realistic and meant to shock and disgust, reminding you that these are children forced into a situation they did not create. When I saw this movie in a theatre with mostly teenaged viewers, during the brutal opening minutes of the Games, you could have heard a pin drop. A potential problem with transforming a novel written in first person into a movie is whether to indicate the point of view of anyone else. In this case, the screenwriters wisely avoided having Katniss as a narrator and instead delve into goings-on that she either doesn’t know about or could only guess at. Thus, we get to see smiling commentators doing a sickening play-by-play of the action in the arena, the orchestrations of the Gamemakers as they manipulate the fates of the tributes, and the reactions of the citizens of a poor outlying district after their tribute falls. One thing with which I was not quite satisfied was the portrayal of Peeta’s feelings for Katniss. In the book, one is never completely sure if he is using this as a strategy to gain the viewers’ sympathy or if he is sincere. In the movie, Peeta is more straightforwardly lovesick. But either way, Katniss has been so focused on survival all her life that she is unaware of her own attractiveness and hasn’t really considered romantic relationships, so she is caught quite by surprise by Peeta’s declarations. Jennifer Lawrence as Katniss is excellent. She did many of the stunts herself, and she was trained how to properly handle a bow and arrow. But she is also an adept actress, navigating the complex terrain between being tough and terrified. The PG-13 rating for “The Hunger Games” is appropriate. Although the book is considered youth fiction, the movie will likely appeal to adults as well. In fact, grown-ups might more readily appreciate the parallels between the post-war future that is shown and our present-day society. You do not need to have read the book to understand the movie, and if you have read the book, the movie has quite a lot to offer. Even though I knew the plot well and had some idea of what was coming, there were still moments that made me gasp with surprise. The fight sequences in “The Hunger Games” are rather rapidly cut and might be dizzying to those with motion sickness or cognitive dysfunction. But the rest of the film is easy to follow and impressively atmospheric. None of the book’s major plot points were left out, although there was some compression for time. 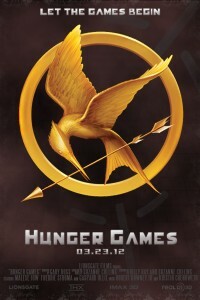 “The Hunger Games” is a bit dark, but it is quite compelling. And one might say that those who do not learn from this possible future might be doomed to repeat it. Have you seen the movie yet? what do you think? Comment below! I’ve read the books twice now and glad to hear the movie is that good. The books are haunting. I’m not surprised they simplified the business about Peeta’s feelings for Katniss, a movie has to trim subplots in order to make sense as a movie. To go into that kind of depth they’d have had to turn it into one of those ten or fifteen hour television serial events.